Paperback, 8.75 x 11.25 in. / 64 pgs / 88 color. 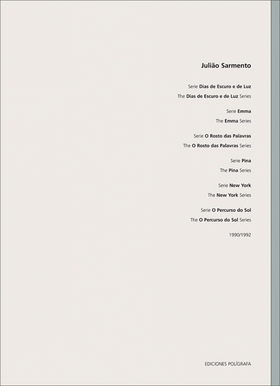 This first volume of a two-volume edition features a decade of work by Lisbon-born multimedia artist Julião Sarmento, who represented Portugal in the 1997 Venice Biennale. 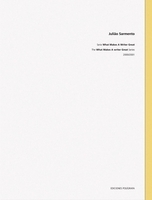 Volume 1 collects series from 1990-1992: "Dias de Escuro e de Luz," "Emma," "O Rostro das Palavras," "Pina," "New York" and "O Percurso do Sol"; volume 2 will focus on Sarmento's text-based paintings, such as "What Makes A Writer Great" (2000-2001), produced as an ironic discourse on the subject. 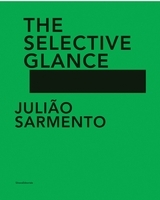 Sarmento in fact has a particular relationship to writing: "I function almost as a writer, not in the classic sense, but simply in the sense of writing with images." Sarmento's expressive, often figurative work addresses this very tension between text and image through a combination of film, video, sound, painting, sculpture and installation, often describing psychologically charged moments of sensuality, voyeurism or transgression. 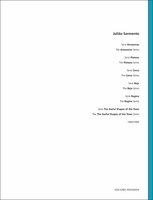 Edited by Danilo Eccher, Riccardo Passoni. Text by Sergio Mah, Alexandre Melo. FORMAT: Pbk, 8.75 x 11.25 in. / 64 pgs / 88 color.